A warm Scottish welcome awaits you at our family run guest house. 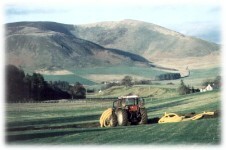 Set on a working hill farm, we are at the heart of scenic Glenholm near Peebles in the Borders region of Scotland. Whether you require relaxing holiday accommodation or bed and breakfast for a couple of nights, the Glenholm Centre will have something to offer. We also provide computer training, a peaceful meeting place away from the distractions of the office, and we are home to the Glenholm Wildlife Project.